Residential and commercial property owners are regularly plagued by the dangers of indoor toxic mold growth, especially in aged properties. SI Restoration, a leading presence in the mold remediation industry for almost three decades, creates awareness while answering the top five questions about toxic mold in new construction properties. New Construction Properties are known to experience aggressive mold growth. What most new property owners forget is how recently their building was exposed to elements such as rain, snow, and humidity. Mold growth in residential and commercial properties is a dangerous but common problem. Home and business owners regularly find colonies in damp, dark, humid areas like basements, attics, garages, bathrooms, kitchens, and crawl spaces. Though mold is a fungal growth that occurs both indoors and outdoors, indoor mold that colonizes and thrives is often toxic, causing health hazards like skin and eye irritation, congestion, lung deficiencies, asthmatic symptoms, and high fevers. Since toxic mold exposure can affect those who are both regularly allergic to mold spores and those who are not, residential and commercial property owners must remain on high alert of toxic fungal infestation. While owners of older properties may seem more likely to uncover a growth in their home or business, mold remediation expert SI Restoration’s recently published article “New Construction Mold FAQs" calls new construction buyers to action while creating an awareness around new construction mold remediation. New construction mold remediation is needed for a number of reasons. What most new property owners forget is how recently their building was exposed to elements such as rain, snow, and humidity. Before homes and business are sealed with roofing and walls, basic elements like insulation, drywall, and concrete can become excessively moist due to precipitation and other natural elements. 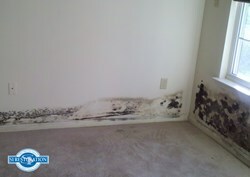 Moisture can be locked into a new construction property causing aggressive mold colonies to form. Another culprit guilty of introducing mold spores into a new construction scenario is lumberyard mold. A majority of lumber is stored outdoors, exposed to moisture just like new construction properties themselves. Colonies can fester in stacks of lumber, going unnoticed even after it is used in the construction of the new property. Should this tainted wood be used, spores can travel throughout the building, contaminating multiple areas. Part of SI Restoration’s call to action includes tips on how to choose a reputable commercial mold remediation contractor. Guidelines like proper insurance, safe use of biowashes and chemicals, and containment should be closely followed. To prevent cross contamination into other sections of the new property, proper containment practices outlined by the Environmental Protection Agency (EPA) and the Institute of Inspection Cleaning and Restoration Certification (IICRC) should be instituted.